I am from Kęty, a town located 80 km from Kraków. During my first year of studies, I was interested in the history of Kraków and learned more about how the Holocaust affected the city. I decided to read books written by survivors to learn more about what happened. One day when I was searching for a place to be a volunteer, I found the JCC. I thought it is the best place to find out more about Jewish culture. After spending a lot of hours at the JCC it's difficult to choose one thing. The JCC has given me so many different experiences that will help me with my career and I have also become good friends with other volunteers, members, and staff. The JCC also gives me an opportunity to meet people from around the world and hear their unique stories. What is one of your favorite things about the JCC? The people and the atmosphere! People are always nice, smiling, and helpful. I like helping during Jewish holidays because this is the best opportunity to get to know the members and learn about the celebrations and traditions. The Adam-Adamah project, based on tikkun olam, made me think how I can change my life to find more time to do something for others. It showed me that by learning from each other we can improve the world. From the 11th till the 18th of September, the JCC's GIMEL Jewish Student Club traveled to the USA as a part of Adam-Adamah project. Adam-Adamah is a collaborative environmental conservation project of JCC Krakow, the Harry & Rose Samson Family Jewish Community Center in Milwaukee and the Ginot Ha'Ir Community Council in Jerusalem. Adam Adamah is the result of JCC Global's Amitim-­Fellows Program which connects JCCs across the world. The trip started in Milwaukee, where the group toured the Harry & Rose Samson Family Jewish Community Center. They were surprised to find that some of the members of the senior club had Polish roots and could speak Polish! The GIMEL members and the seniors had a lot to share about Poland and Jewish life in Krakow. On the second day our students went on a one-day trip to Chicago, where they spent the day seeing the most remarkable sights of the city. After this relaxing beginning of the trip, the time for hard work finally began! On the third day all the participants of the Adam-Adamah project hiked through a park to admire Lake Michigan and then went to Rainbow Day Camp where they spent the day picking vegetables and tried outdoor activities such as archery and laser tag. The next day, the vegetables were placed in the food cooperative which provides food for people in need. The students helped prepare and package the food for distribution. At the Rainbow Day Camp harvesting fresh produce for the Jewish Community Food Pantry. Volunteering at the Jewish Community Food Pantry in Milwaukee. In the evening they joined a conference for young Jewish leaders, and the next day the participants of the project took part in art workshops. Divided into groups, the students were instructed to express common aspects of their Jewish identities. Later they were given a tour around Growing Power, a nonprofit organization and land trust which breeds animals and grows vegetables for sale. Later all the participants of the Adam-Adamah project had a Shabbat dinner at local JCC. The final session the Adam-Adamah project was a unique experience for most of the Polish participants, and for myself as well. It was a week full of hard work and we learned a lot, we found the projects extremely inspiring and we have returned motivated to apply what we learned to help our community in Krakow. Every week we host a kosher Shabbat dinner for over 70 members of the local Jewish community and guests from all around the world. Hummus is one of our members’ favorite treats during these events and we can’t imagine Shabbat without it! If you want to bring a little bit of JCC Krakow flavor to your own house, check out this amazing hummus recipe, created by our own kosher chef Kasia. The day before, rinse the chickpeas and pour 2-2 ½ glasses of water in it. Let it stand overnight. The next day, drain off and dry it with a cloth or paper towel. Fry it on a dry pan or deep frying pan with soda water for approx. 3 minutes, stirring. Add 1 ½ liter (1.6 qt) of water and cook. From time to time remove the foam. The cooking time is 20 to 40 minutes, or sometimes even longer, depending on the chickpeas. The best is to try cooking when the chickpeas are very soft. Drain off. Blend it to a smooth spread. While mixing, add the tahini, lemon juice, crushed garlic, salt and a pinch of cumin. At the end pour the water. Blend it for the next 3-5 minutes until the top of the spread is very smooth. Put it into a bowl, cover with plastic wrap and leave it for 30 minutes. After that, hummus is ready! Serve it with pita bread or bread, preferably on a plate and pour some olive oil. Keep hummus in the refrigerator, but it is preferable to take it out half an hour before serving. Smacznego! Do you love hummus as much as we do? Do you have your own hummus recipe that you would like to share with us? Let us know in the comments below! After thousands of years of war and being an occupied territory, Poland finally gained its' own independence on November, 11th 1918! The declaration was a big celebration and victory for Poles, many of whom were Jewish who served on the front line to fight and defend their country. For many Polish Jews, the declaration of a newly independent Polish state on the 11th of November, 1918 was a dream come true. What reinforced this positive feeling was the man behind the declaration of independence, Józef Piłsudski. Widely acknowledged as a philo-semite, Piłsudski believed in the values of the old Polish-Lithuanian Commonwealth. Those values included religious tolerance, freedom of speech, the press, and many others that we have come to know and enjoy. Polish Jews fought with Piłsudski during his days as the leader of the Polish Socialist Party (PPS), and gladly enlisted in his Legions, which became the basis of the independent Polish army. While many Jews no doubt viewed the formation of a Polish state with some skepticism, especially with the presence of Polish ultra-nationalists such as Roman Dmowski, having Piłsudski as leader reinforced for many that this would be a Polish state that was friendly to Jews which the 2nd Republic would become during much of the 1920s and 1930s. Jews were enthusiastic volunteers during the first years of the Polish Republic, fighting on the front-lines in Poland's many conflicts with a myriad of neighbors turned enemies in the post-Versailles maelstrom that was East-Central Europe. Culminating with the Battle of Warsaw in 1920, the “Miracle on the Wisła” was made possible in part by Warsaw's Jewish community, the largest in Poland, who volunteered in large numbers for the battle against the Soviet Union. The Soviets never forgave Poland for their victory, and they forgave even less the many thousands of Polish Jews who fought in the battle to defend their country. Polish Jews understood that the demands of independence did not end with a declaration or even a successful military campaign, and went to vote in large numbers in Poland's first democratic elections. They formed a bloc with other minorities to ensure that their candidate won Poland's first democratically-elected President, Gabriel Narutowicz. Jews became in many ways the political front-line against growing nationalist and ultra-nationalist resentment. Their victory turned to ash in their mouths when Narutowicz fell by an assassin's bullet within a week of taking office, killed by an ultra-nationalist Pole. Despite this setback, most Polish Jews never abandoned Poland, serving in numerous governments and civil service positions throughout the Republic. While we reflect on Polish independence, let us also consider that this meant independence for millions of Polish Jews who had been suffering under subjugation for centuries. The independence of Poland, “Polin”, the land of Jews for millennia, was a seen as a hopeful future for a land of freedom and tolerance. JCC Krakow has a robust volunteer program with over 50 volunteers (most of them not Jewish) which play a critical role in the shaping our Jewish community. Volunteers go through a thorough screening process including an application, interview, test, and intensive orientation to learn about the JCC and about Jewish customs and culture. Our volunteers wear many hats; they help with Jewish holidays, Shabbat dinners, reception duties, and administrative support, and play an important part in our community-wide events such as Ride For The Living, the Jewish Culture Festival, and 7@nite – Night of the Synagogues! You will find our volunteers smiling and laughing with all of our community members and visitors every day of the week. Our volunteers are not only active in the JCC community, but also teach about contemporary Jewish life around Poland. With our Jewish Student Club GIMEL, they created the outreach program Mifgash Educational Group. Mifgash organizes workshops and lectures for young Poles in elementary, middle, and high school to educate on both historical and contemporary Jewish life. 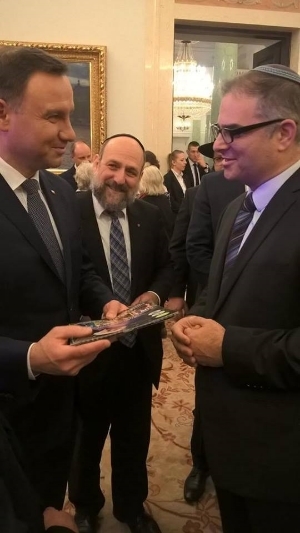 By reaching Poles who live where there are no Jewish communities, they are reversing many stereotypes that have proliferated since post‐war and Communist Poland. What inspired these young adults to volunteer their time at JCC Krakow? If we take a look back at Krakow between 1968 and the JCC’s opening in 2008, Krakow did not have a visible Jewish community. Jewish culture was something appreciated as a piece of the past, through cultural events with no actual Jews. When the JCC opened, young Poles who were interested not only in Jewish culture but also in helping to rebuild the community began to volunteer. Get to know some of our new and seasoned volunteers and find out what inspires them about JCC Krakow to volunteer! After learning about our volunteer program from a classmate, Aleksandra decided to get involved because it combined her desire to do do something good for the world and her growing interest in Jewish culture. Aleksandra loves volunteering at the JCC because of its unique atmosphere and for the opportunity to meet interesting people from both the local community and all over the world. She is from southern Poland and moved to Krakow for university; even though she sometimes gets homesick, she never feels that way at the JCC - it has become her new family and gives her a feeling of belonging in a new city. Aleksandra loves celebrating the holidays with the community and, to her, the JCC is simply the best place in the whole world. In 2009, Magda came to the JCC to learn Yiddish and quickly became friends with many of our students and volunteers. She learned about the volunteer program and she thought it would be a great opportunity to be more involved at the JCC. By spending her time as a volunteer at the JCC, she's expanded her horizons about other cultures and religions and also has met some really great people. Justyna, a Krakow-native, learned about the JCC from her friends. For her, Jewish culture is rooted in the history of Krakow and in Poland. Justyna feels that Jewish life and culture is very present in Krakow, but at the same time is easily forgotten. She sees the JCC's existence as the biggest reason Jewish culture remains vivid. Being a volunteer here is the best way for her to get to know about the Jewish culture, customs, traditions and religion. Justyna is looking forward to getting to know many interesting people and hear about their unique family history. Weronika was introduced to the JCC by a friend who was volunteering and came to many workshops and events. Weronika decided to become a volunteer because she wants to learn and be a part of the Jewish society in Krakow through ways of community service and social work. She is looking forward to meeting new, interesting people and participating in Jewish holidays. After studying Hebrew at the JCC and speaking to an old friend who is a volunteer, Maja decided becoming a JCC volunteer was exactly what she was looking for! Maja wants to help rebuild Krakow's Jewish community and she thinks it is something truly beautiful that so many people want to be involved. Maja has become great friends with her co-volunteers, community members, and tourists. She also likes that is has helped her to develop her knowledge of other cultures and customer service skills. Eugeniusz is from Dnipropetrovsk, Ukraine and heard about the JCC volunteer program through Facebook. Eugeniusz decided to apply to learn more about how a non-profit organization operates and to help Krakow's Jews grow their community. Eugeniusz is looking forward to developing his personal skills, learn more about Jewish culture, and meet new people who have similar interests as him. In her first year of high school, Joanna had the opportunity to learn Hebrew. She really enjoyed learning the language and about Jewish culture. When the class ended, she still had a desire to learn more. 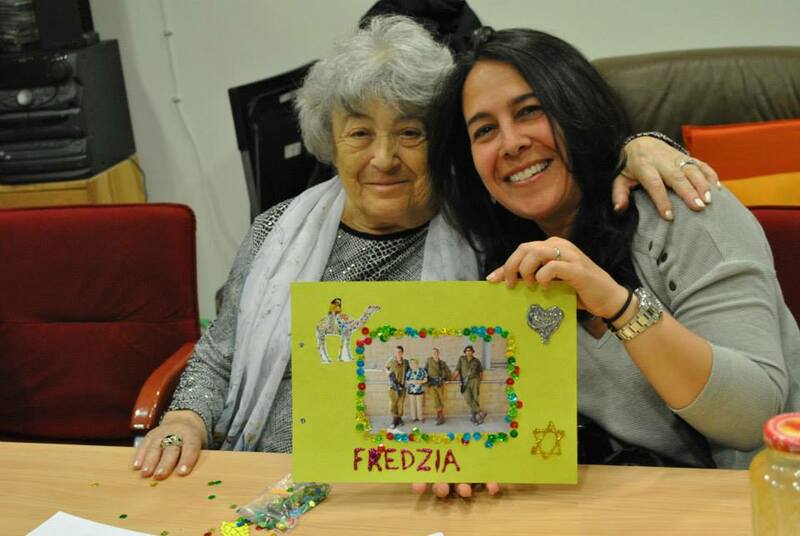 When she moved to Krakow, a few of her friends were volunteers at the JCC and told her about the program. She went on JCC's website to found out more information about the program and told herself " You should definitely apply!" and she became one of the volunteers! Being a volunteer gives her the chance to learn Judaism and practice her Hebrew which she is continuing to learn at the JCC. Wholeheartedly, Joanna is hoping to develop and grow as an adult during the time she spends at JCC. She is looking forward to meeting new people, make new friendships and extend her knowledge of Jewish culture. Katarzyna learned about the JCC during the Jewish Culture Festival in Krakow. 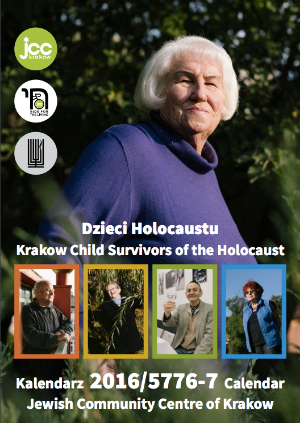 When she got home, she looked at JCC Krakow's website and read about the volunteer program. She decided to apply to enrich her knowledge of Jewish culture and contemporary Jewish life. Katarzyna is looking forward to volunteering at the JCC and expanding her personal interest in Judaism. While guiding a year ago, Eliza's tourists wanted to visit the JCC and learn more about Krakow's Jewish community in Krakow. That's when she learned that she could be a part of the JCC community as a volunteer. She has always been interested in Jewish culture since she was in high school. To her, the JCC is one of the best places to learn about Judaism, Jewish life in Krakow, and Jewish culture. It has also helped her to be a better guide for her Jewish tourists. Anna learned about JCC's volunteer program through the JCC's Facebook page. She decided to become a volunteer because helping at the JCC would be a wonderful chance to meet new people, hear their stories, gain practical knowledge about Jewish religion and culture, and to learn new skills. It is because of the JCC's atmosphere and environment that Anna has signed on for another year. The JCC is filled with fantastic and inspiring people and she is glad that she is also a part of this community. Can't Make it to Poland for Ride for the Living? Join A Satellite Ride! As over eighty participants from around the world join us in Poland for the Second Annual Ride for the Living on Friday, June 5, 2015, six other communities will also be cycling along with us! Can't come to Poland but want to get involved? Do you live in or near Columbus, Baltimore, Dallas, Palo Alto, Boston or Miami? Join a satellite Ride for the Living event and cycle alongside us in Poland as we depart the iconic Birkenau gate towards hope and the future at JCC Krakow! Event details for each participating community are listed below. Want to create a satellite Ride for the Living event in your community? Contact Jessica Rosenberg, Director of External Relations at jessica@jcckrakow.org for information on a 2016 satellite event. All Spin classes at the Greater Boston JCCs will be dedicated to Ride for the Living. Frida and Małgosia, the JCC Krakow Senior Club Coordinator tired but happy after the week long visit. We woke up to the smell of the sea and the feel of the Tel Aviv sun streaming into our rooms. Our last day in Israel and the weather was perfect. We checked out of our hotel and began our day at Shuk HaCarmel and the Nachalat Binyamin arts & crafts market where we picked up presents for our friends and family back home. The shuk was an explosion of color, taste, sound, smell and even touch- what felt like thousands of people in a very small place. Our group in the Independence Hall. Enjoying the Tel Aviv sun. After Independence Hall we said something that was in short supply during our week in Israel-free time. Some of us went for walks, others did some shopping or saw family members living in Israel and one of us even went to visit her former nanny whom she hadn't seen since 1964! Our final activity in Israel was a walk along the beach by the port, an area that has become a popular destination for Tel Avivians and we could see why-cafes, shops, restaurants and a beautiful boardwalk. Saying goodbye to Tel Aviv and Israel. As we watched the sun set and felt the last of its warmth on our faces, we thought about our week in Israel and saw her history reflected in our own lives. A story of survival against the odds, a story of hope, and a story of the resilience of a land and of a people. Whether or not we visit Israel again, she will always be with us. And we with her. After an intense three days, we were all too happy to spend a restful Shabbat in Jerusalem. We all did our own thing, whatever each of us needed to recharge his batteries-some rested, some met with their kids living in Israel, and some chose to wander Jerusalem’s mystical streets. We met again in the evening for a special Havdalah with our friend, Rabbi Boaz and we ushered in the week with song. Wandering around the Old City. It’s a good thing that yesterday was the day of rest because today was full of joy, wonder, and emotion. We drove to the Zion Gate for our first visit to the Old City. It was a beautiful, sunny day and we walked the ancient streets with our guides as well as Rabbis Avi and Boaz. Rabbi Boaz was raised in the Old City and shared some of her hidden secrets with us. After seeing King David’s tomb and the Cardo, we descended the steps to the Kotel, resplendent in the late morning sun. Being in Judaism’s holiest site inspired some of us to pray and some to place notes in the cracks of the wall, hoping our private wishes would come true. Pani Zosia heads to the Kotel along with the rest of the group. We had a yummy lunch at Kibbutz Ramat Rachel and then we drove in the early afternoon to Yad Vashem for what was sure to be a powerful experience. Our guide, Ewa Lutkiewicz spoke perfect Polish and was extremely knowledgeable. As you might imagine, visiting Yad Vashem is particularly difficult for Holocaust survivors but we were glad to be there nonetheless. For many of us, saved by non-Jewish Poles, visiting the Garden of the Righteous which commemorates their heroism was the highlight of our trip to Israel so far. Anna paid honor to the Righteous Among Nations that helped her survive. We were honored to be hosted after our tour by educators and guides from Yad Vashem who asked us to tell them our stories so that they might live on and be passed to the next generation. It wasn’t easy and tears were shed but we emerged feeling strong, united, and proud that we were able to help. Our group with educators and guides from Yad Vashem. We left Yad Vashem saddened by the terrible loss but knowing that our stories of survival belong to the whole Jewish world and mirror the story of the Jewish people: Against all odds, we not only survive but thrive. We started the day bright and early but the weather didn’t cooperate-it wasn’t very bright outside and the rain was falling. We checked out of our hotel in Tiberias and headed toward Jerusalem. On the way out of Tiberias we stopped at the burial place of Maimonides and Rabbi Avi gave a talk his life and teachings. Rabbi Avi teaching about Beit Alfa. Due to the rain we had to cancel our cruise on the Sea of Galilee and we decided to explore Beit Alfa, a sixth century synagogue with beautiful mosaics. We then stopped at a pilgrimage site at the Jordan River near Jericho and saw a group of Koreans being baptized. Ryszard and Elzbieta in the VIP section of the main hall of Knesset. After catching a glimpse of the Dead Sea, which we’ll visit tomorrow, from the bus, we turned west and headed toward Jerusalem. Needless to say it was very emotional as we entered Israel’s capital, and we rushed to get to the Knesset on time. We had a private tour of the Knesset, saw the Marc Chagall tapestry and then went and had a seat in the main hall of the Knesset. Elections are coming up next week and everyone was talking about politics. Halina visiting Jerusalem for the first time. Our next stop was interesting and delicious-we drove over to Machane Yehuda, Jerusalem’s incredible shuk where we ate falafel, bought all kinds of snacks and even found some strawberries, but to be honest, we all agreed that nothing tastes like Polish strawberries. After the shuk we checked in to our hotel and had a great dinner. Can’t wait for tomorrow-Massada and the Dead Sea and then Shabbat in Jerusalem!